When you’re a cruise line that has built a solid reputation upon designing and constructing ships that represent “the next big thing,” it’s inevitable that some features won’t be available on all ships in the fleet. But Miami-based Royal Caribbean is mindful of this fact, and its solution is a simple one: Give the people what they want. 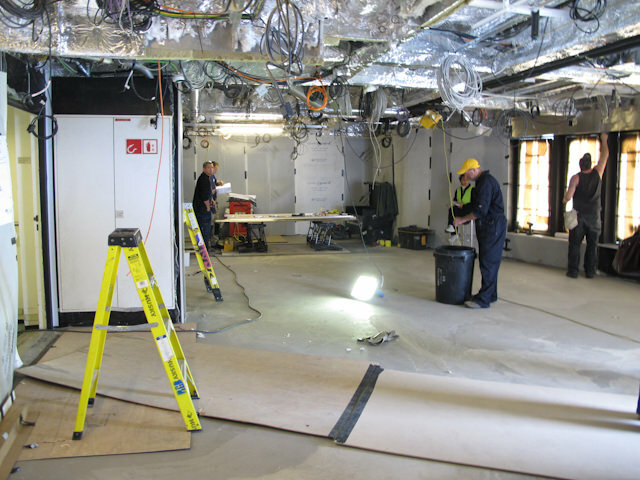 To do that, the line began what may be its most ambitious refurbishment program to date: the Royal Advantage. 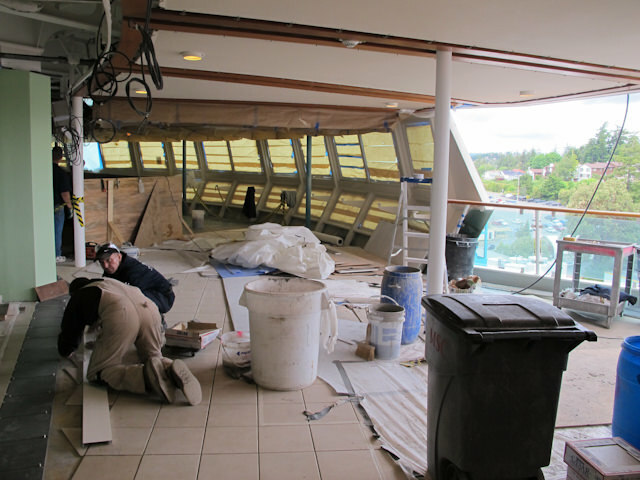 Radiance of the Seas is currently undergoing a major 21-day refit at the Victoria Shipyard’s Esquimalt Graving Dock, located in Victoria, British Columbia, Canada. 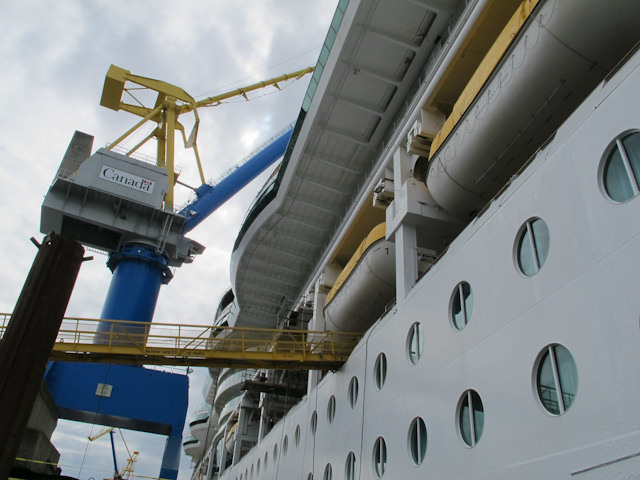 One of the largest drydocks on the West Coast, the Esquimalt Graving Dock has been used by a number of cruise lines over the years for refits, and it’s a tradition the Province of British Columbia would like to see continue. 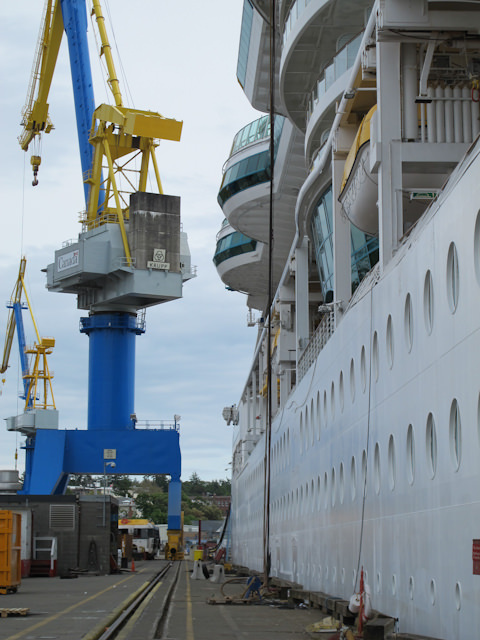 British Columbia’s Attorney General, Barry Penner, was on-hand aboard Radiance to speak to the importance of Royal Caribbean’s decision to perform such an extensive drydock operation in the capital city. Lisa Bauer, Royal Caribbean’s Senior Vice President of Hotel Operations summed up the decision to extensively refit Radiance of the Seas by saying that every new addition to the ship had been heavily influenced not only by passenger comments but also by the line’s dedication to providing passengers with a high quality onboard experience consistent throughout the fleet. 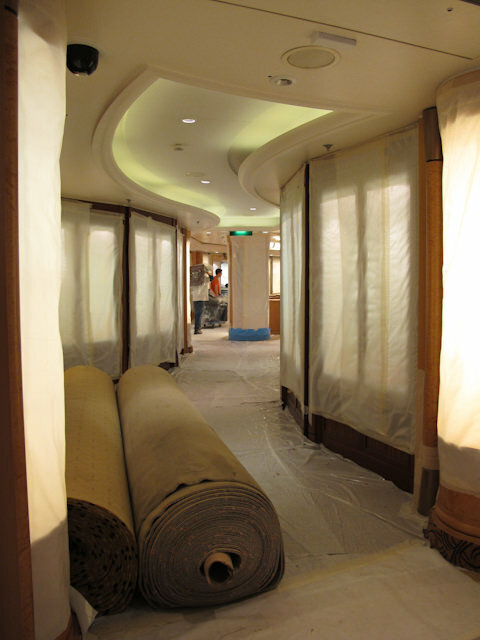 Radiance’s Royal Advantage makeover includes several additions for the ship, including single-occupancy staterooms, several new dining venues, an authentic English Pub, a large outdoor movie screen, enhanced Diamond and Concierge lounges, a new Royal Babies & Tots Nursery, and digital wayfinding signage. 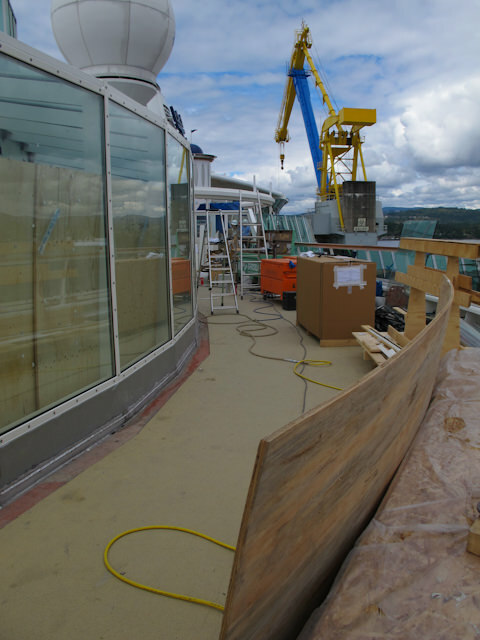 Additionally, the vessel is getting a top-to-bottom refurbishment on her “soft” furnishings, like new carpeting and upholstery. 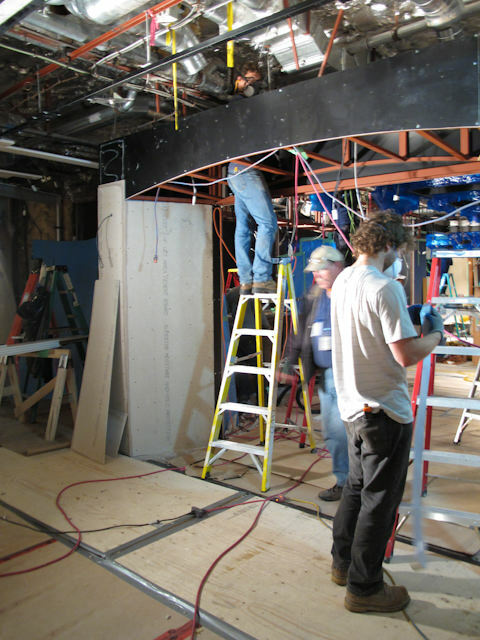 Even though we saw the ship during the initial phases of the drydock, we could already see the careful planning and well-timed execution coming together to make an already fantastic ship even better. So what’s happening to this 2001-built ship? Let’s take a look at the enhancements in store for passengers when she sets sail from Vancouver on Friday, June 10. Keep in mind: these are shipyard photos. 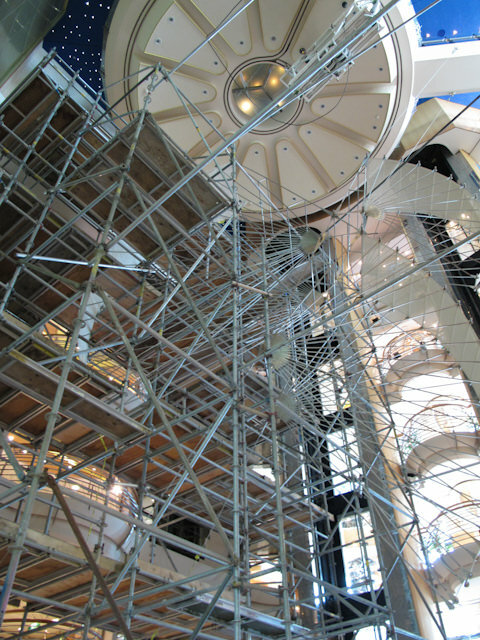 A bit of imagination may be required to fully visualize how these spaces will look the day she leaves drydock, but we thought you’d like to see the workmanship being put into the Royal Advantage refurbishment. 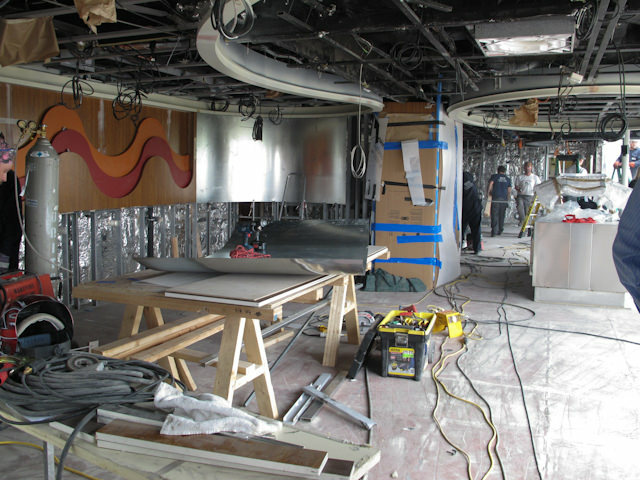 Though it’s hard to tell now, in just a few days the former Seaview Grill on Deck 12 aft will become a feisty steakhouse experience called the Samba Grill, first introduced aboard Allure of the Seas. Main courses at the Samba Grill will include a choice of thirteen different meats, all of which are carved tableside. Specialty caipirinhas, fine wines and desserts are also on offer. Open each evening, the Samba Grill can be pre-reserved online or onboard the ship for a cover charge of $25 per guest. 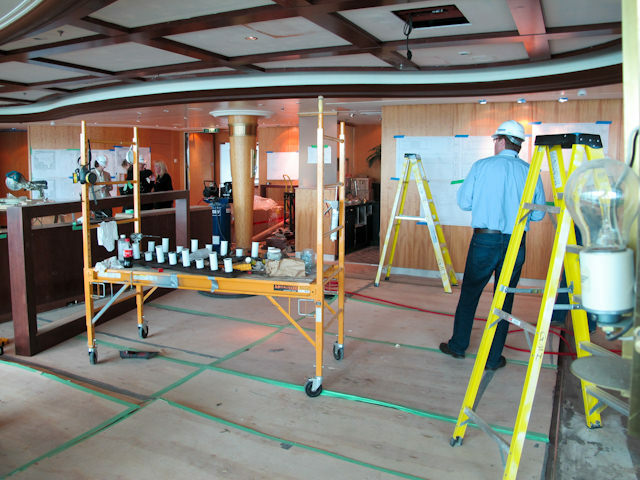 On Deck 6, next to the beautifully wood-panelled Colony Club lies the future home of the most intimate dining option aboard Radiance of the Seas: the Chef’s Table. Seating just 14 guests, the Chef’s Table serves up a sumptuous five-course dining experience, complete with fine wine pairings. 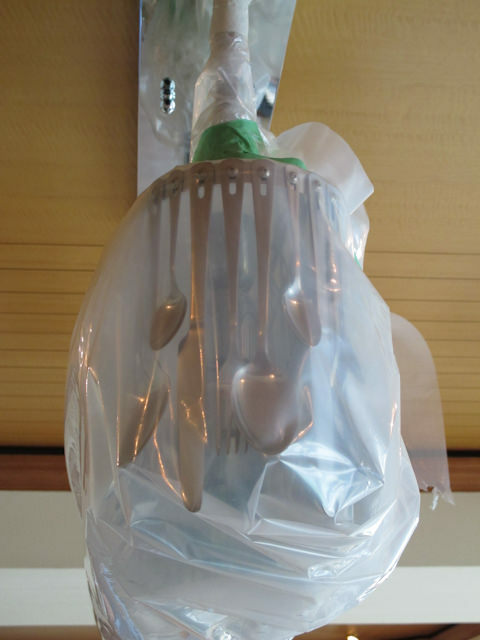 The room boasts the same elegant ambiance as the nearby Colony Club, and the knife-and-fork chandeliers are some of the most interesting we’ve seen in a long time. The cover charge is set at $95 per person, but before you balk at the price, consider this: the experience here, particularly in Alaska, looks like it will be as stunning as the scenery passing by the enormous windows in this special room. Not all venues being added to Radiance of the Seas boast cover charges, and Rita’s Cantina is just one example of the new complimentary dining options available to passengers. 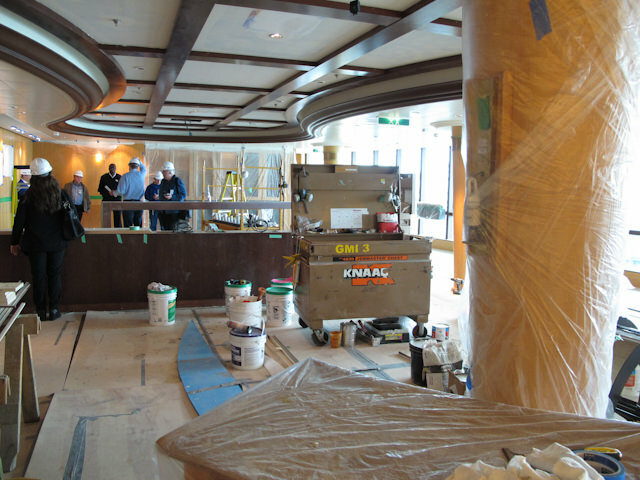 Seating 83 guests and occupying the starboard side of the Windjammer Café on Deck 11, Rita’s Cantina will be open for lunch and dinner in a walk-up, no-reservations required format. Sumptuous Mexican cuisine and a wide selection of Margaritas are available here. 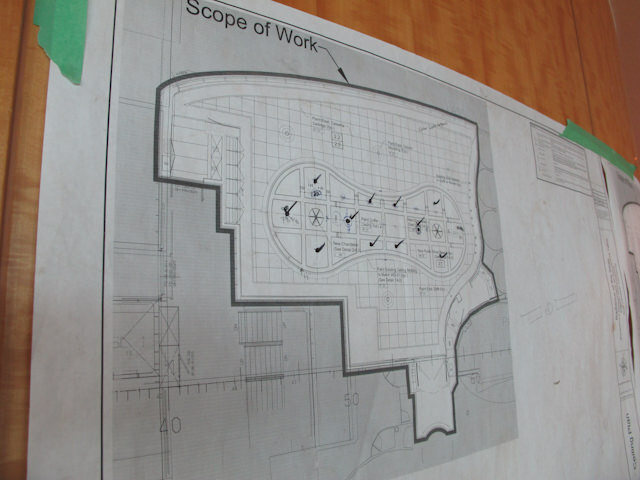 Rita’s will cater to families by day while turning into a more adult-themed venue at night. Also located in the Windjammer on Deck 11 is Izumi, an a la carte dining option that can be reserved online pre-cruise. Izumi specialises in traditional Japanese fare, like sashimi, sushi, and a variety of sukiyaki dishes. The focus here will be as much about the incredible variety of food and its presentation along with the stunning ocean views offered from this key Deck 11 vantage point. Designed to pay homage to the rich heritage and cuisine of the Tuscany region of Italy, Giovanni’s Table is located in the spot formerly occupied by Portofino’s on Deck 6. This new Italian Trattoria is open for both lunch ($15 per guest) and dinner ($20 per guest.) 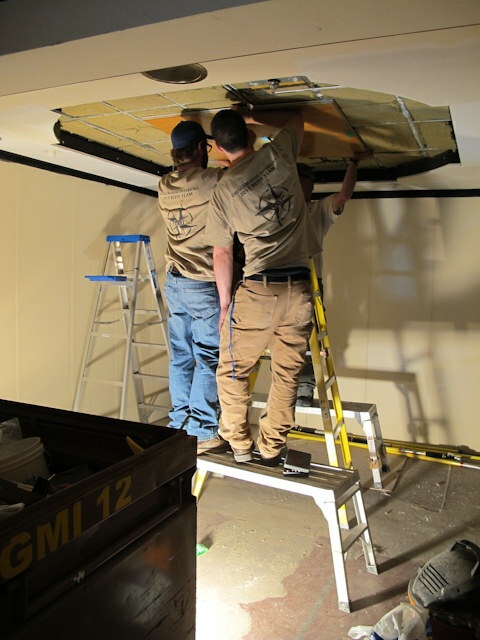 You can see the basic outline of the room coming into shape: new light fixtures are being hung, walls installed, and new flooring is being laid down. With floor-to-ceiling windows, expect the views here to be fantastic. Even in its unfinished state, I can tell this is going to be one of my personal favourite additions to this ship. 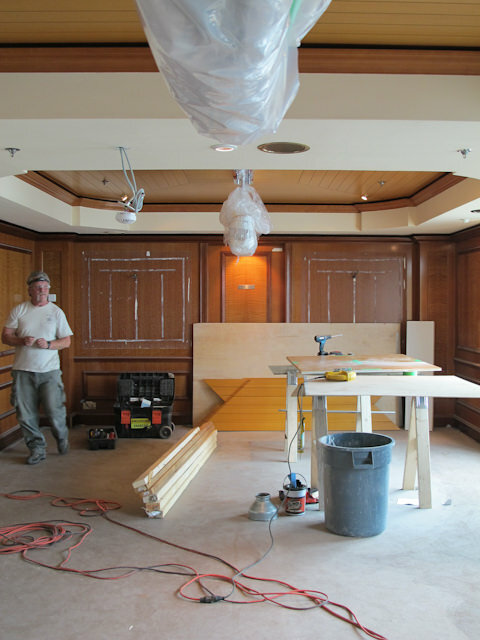 Replacing the Scoreboard Sports Bar on Deck 6 forward, the Quill & Compass Pub was designed to appeal to cruisers around the world with its warm, inviting atmosphere that mimics your favourite local. With its dark wood panelling and sleek, long bar, expect this to be a very popular hangout into the wee hours. Live music and an extensive list of imported beers and ales make this an area fitting of its English Pub designation. 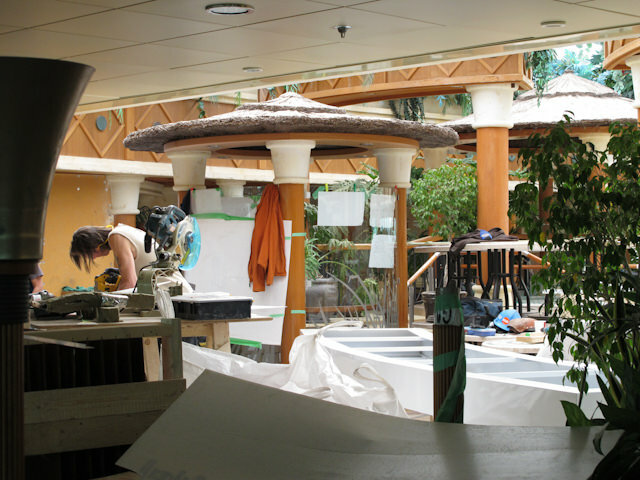 Located inside the Solarium on Deck 11, the Park Café is the perfect place to grab a quick bite to eat, all without leaving the comfort of the beautiful poolside, glass-domed enclave that is the Solarium. 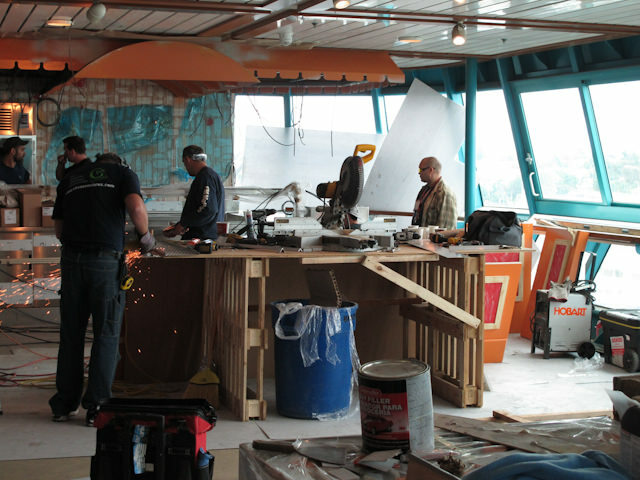 Originally implemented on both Oasis and Allure of the Seas, the Park Café has proven to be an incredible hit with passengers, and it’s no stretch to imagine that same success happening in its new incarnation aboard Radiance of the Seas. Located on Deck 11 on the port side of the Windjammer café is honestly one of my favourite additions to Radiance of the Seas: the Boardwalk Dog House. Open daily and with no additional charge, the Dog House serves up Hot Dogs, brats and sausages and most importantly, it’s fun! 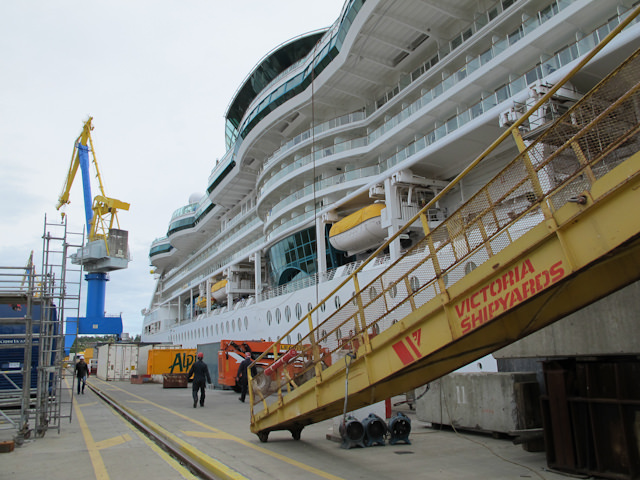 First introduced onboard Allure of the Seas, this venue has become such a favourite that plans are in the works to also add the Dog House to Splendour of the Seas when she undergoes her own Royal Advantage refit later this November (more on that to come!). 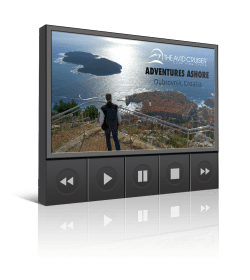 Tomorrow we’ll continue our incredible shipyard tour of Radiance of the Seas to discover the other aspects of her Royal Advantage refit, including details about the new Royal Babies & Tots Nursery, the new technology enhancements (including those very-cool Digital Wayfinder screens), and of course, the new pool-deck mounted outdoor movie screen! 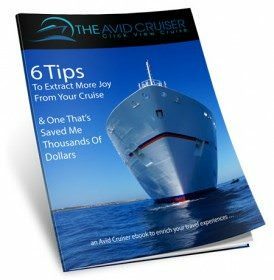 Until tomorrow, why not check out our Radiance of the Seas ship review right here on The Avid Cruiser? Thanks so much for this post! 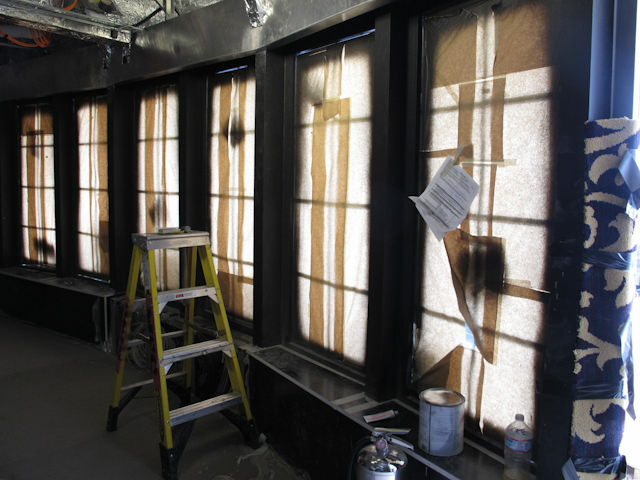 I have recently been really looking for more information regarding windows in the victoria bc. I find this information to be very interesting.